City of London Police chooses to use Nikkalite® Flexible Crystal Grade retroreflective and fluorescent liveries supplied by Rennicks. New Innovative Technology Introduced on to the Manchester Smart Motorways Scheme. 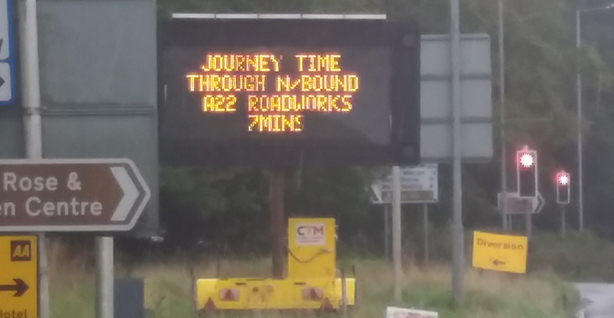 East Sussex County Council benefits from the Rennicks Virtual Journey Time System during planned works on the A22 London Road - a very busy strategic route which sees an estimated 20,000 vehicle movements per day. Highways England already had a method of measuring journey times through the works – but they didn’t have anything with the capability to calculate diversion route times. With large sections of the motorway closing, it was important to communicate effectively with the general public. With the need to stand out from the crowd, the exceptional Nikkalite® Flexible Crystal Grade, Microprismatic Retroreflective Material from Rennicks UK, has been chosen for the conspicuity livery on the NEW VAG Financial Services, Skoda Scout Ambulance demonstrator. New gateway signs to ensure everyone entering Leicester will be given a proper welcome into the historic city. Rennicks' approved Gold Converter - Fleet ID Limited - has developed, designed and installed on site the bright new ambulance fleet livery for Great North Children’s Hospital. Rennicks installs red studs which flash LEDs on a 2Hz cycle 24 hours a day, 7 days a week to provide advance warning to bus drivers of the potential risk of pedestrians crossing. To enhance their fleet, featuring their support for Scotty’s Little Soldiers, DX Delivery selected to use Rennicks ECE 104 conspicuity tape and digitally printed Flexible Engineering Grade. Royal Windsor & Maindenhead Council becomes proud owner of the very first Advantage HDC Tri-Colour mobile Variable Message Sign to be sold in the UK to control traffic with advance warnings, enabling drivers to seek alternative routes and avoid key congestion points. TfGM are rolling out new bus stations across Greater Manchester and have identified the need to provide bus drivers with greater awareness of pedestrian crossings to aid safety. Rennicks installed red flashing Active Studs to provide advance warning to bus drivers.